Your rugs have been adding warmth, color and style to your home. You maintain it fairly regularly and are wondering whether a rug pad would help in protecting and extending the life of your rugs. Are rugs pads really necessary? Here are 5 reasons why you should invest in a rug pad. When you walk on rugs, especially when they are placed on hard and slick surfaces like parquet, marble or even tiles, they have a tendency to shift. Rug pads are designed to stick to both the floor and the rugs, ensuring the safety of you and your loved ones. This is very important when you have young children and the elderly living with you, as they are prone to falls. Sometimes, it is recommended that you use double sided tape on the rug pad for an added layer of safety. When you place your rugs on carpets or specially prized floors which stain easily, using a rug pad can help you to prevent wet spills from reaching these carpets or floors. Additionally, since most rug pads have ridges and bumps built into them, pockets of air are created, which will help greatly when vacuuming your rug. These ridges and bumps also help to trap particles of dirt and dust, leaving your rug cleaner and your indoor air quality better as a result. Rug pads take on the friction and pressure that your rugs usually do. 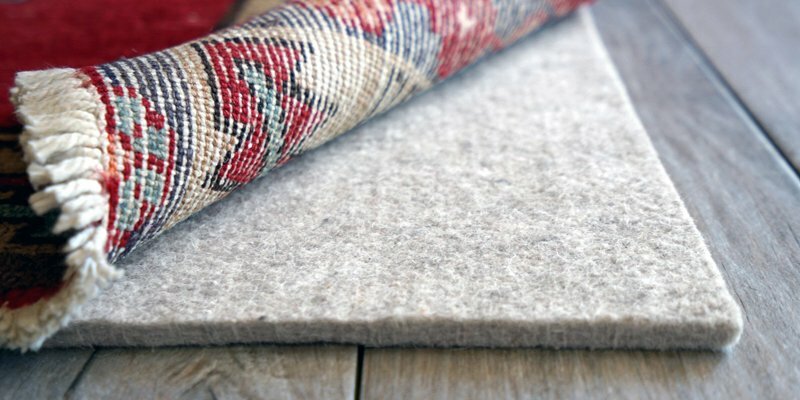 All the shifting and rubbing, not to mention tumbles and falls from highly active children, can wear out your rugs from the bottom, resulting in a prematurely aged rug. Placing a rug pad between your rug and the floor will lessen this damage and extend the life of your rug. In some cases, dirt, dust and other particles collect over time under your rug. With prolonged use and infrequent cleaning, these particles will begin to scratch your hardwood, parquet and marble floors and also wear down carpeting. Rug pads give your floors an extra layer of protection from these scratches. So, take some time to do research on the best rug pads on the market and invest in a good one. They will ensure that your rugs remain in good condition for years to come.